Dental implants are required when there is tooth loss due to injury, decay, or infection. With an estimate of 300,000 implants required annually, it has been predicted that by 2020, that number will rise significantly (1). These dental implants rely heavily on the presence of a structured alveolar ridge, as the titanium screw used for fixation requires a specific dimension for insertion. Hence the presence of an optimum alveolar ridge is pivotal for the correct insertion and ultimate success of the dental implant. 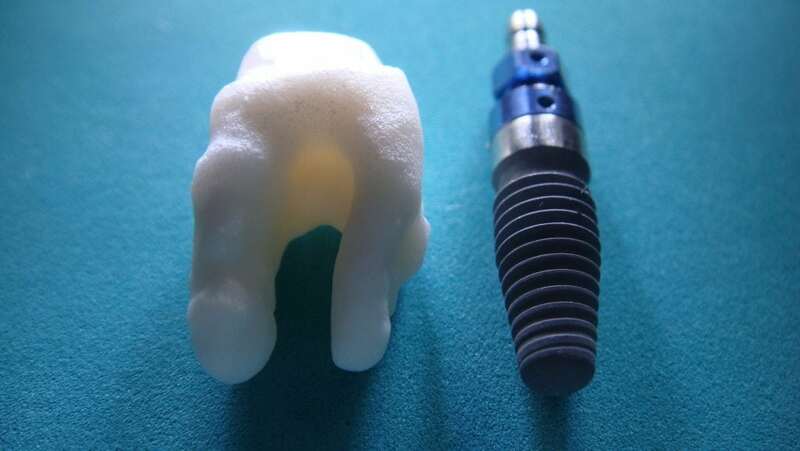 In order to combat limitations associated with conventional allografts and autografts, biomaterial-based substitutes that can potentially repair and regenerate alveolar ridge to compensate for structural loss are becoming increasingly popular. The structural aspects, compatibility, bioactivity, and strength should match the replacement tissue followed by enhancing interaction with the surrounding microenvironment, ultimately facilitating tissue regeneration. Our research group focuses on the use of biopolymers (natural, synthetic) and developing composites with the incorporation of nanoparticles for targeted applications. In order to address the problems associated with the insertion of dental implants, our research group has been working on developing economically-feasible biomaterial-based composite scaffolds. The site of application is vulnerable to infection, which, if not addressed, will lead to eventual loss of the implant; we incorporate biomaterials with antibacterial properties to tackle the risk of infection. The scaffolds can serve as biocompatible matrices providing ideal alveolar ridge for the optimal insertion of the dental implant. In this regard, we have published two papers where we explored the development of composite scaffolds which can be used as alveolar bone substitutes (2) and promote alveolar ridge augmentation (3). In the latter study, we explored a simple freeze-drying technique for the fabrication of the three-dimensional porous scaffolds. The component biomaterials were chosen based upon their intrinsic properties that can contribute to the success of the scaffold at the alveolar ridge. The components constituted of naturally derived polymer chitosan (extracted from shrimps), the ceramic component bioactive glass (BG), Hydroxypropylmethyl cellulose (HPMC), a biodegradable polymer and ZnO nanoparticles; where each component significantly contributes to overall features of the scaffold. Chitosan is biocompatible and antibacterial and modulates degradation rate; bioactive glass promotes bone formation, contributes to mechanical and physical properties, and possesses antibacterial features; ZnO promotes differentiation of pre-osteoblast cells to osteoblast cells (bone specific cell type) whereas HPMC, a polymer, facilitates the process of crosslinking, providing the structural support and morphological features that can expedite the repair process. These three-dimensional cross-linked scaffolds were prepared by varying composition of bioactive glass. This was done to identify an ideal candidate with optimal features that can be placed at the target site of the alveolar ridge. Our results indicated that at an optimum concentration of bioactive glass, the scaffolds possessed good strength, feasible degradation rate, adequate porous structure, and morphological characteristics that can promote biological entities. This reiterates that these scaffolds can promote repair and regeneration at the defective site which is crucial for the development of the required alveolar ridge. These matrices were in general nontoxic to the cells, and when cells were grown on these scaffolds, they remained viable with an increase in the number of cells with the passage of time. The three-dimensional porous structure facilitated the supply of oxygen and nutrients throughout the scaffold hence providing favorable microenvironment where the cells were attached on and within the porous structure and increased in number with the passage of time. Adding on, the scaffold possessed intrinsic ability to promote the cells to differentiate into bone specific cell type and degrades in accordance with new tissue formation which signifies its potential in the repair of the alveolar ridge. In parallel, S. aureus’s growth, a bacteria frequently present at the site of infection, was considerably hampered by these scaffolds. Hence we conclude that an ideal combination ratio as seen in case of Chitosan, HPMC, ZnO, and BG can serve as matrices that will promote the process of alveolar ridge augmentation. Further investigations are being carried out that will shed light on the exact molecular mechanisms that facilitate the repair process. These findings are described in the articles entitled, Hydroxypropylmethyl cellulose (HPMC) crosslinked chitosan (CH) based scaffolds containing bioactive glass (BG) and zinc oxide (ZnO) for alveolar bone repair, recently published in the journal Carbohydrate Polymers, and Chitosan/hydroxyapatite (HA)/hydroxypropylmethyl cellulose (HPMC) spongy scaffolds-synthesis and evaluation as potential alveolar bone substitutes, recently published in the journal Colloids and Surfaces B: Biointerfaces. Dr. Ather Farooq Khan is affiliated to Biomedical Materials, COMSATS Institute of Information Technology, where Dr. Ather Farooq Khan is currently working as Professor. Dr. Ather Farooq Khan has authored and co-authored several national and international publications and also working as a reviewer for reputed professional journals. Dr. Ather Farooq Khan is having an active association with different societies and academies around the world. Dr. Ather Farooq Khan made his mark in the scientific community with the contributions and widely recognition from honourable subject experts around the world. Dr. Ather Farooq Khan has received several awards for the contributions to the scientific community. Dr. Ather Farooq Khan major research interest involves Biomedical Materials. Previous Post« Previous Does Progesterone Increase Women’s Disgust Sensitivity?